I have some mixed feelings after finishing this comic book. The idea of the Punisher is an interesting one… especially since many of the other characters in the Marvel verse have completely different morals and ethics to him. On the other hand, his decision to play judge, jury and executioner doesn’t really make him a character that sits right with me. The first comic was intriguing, with the Punisher believing going after Spider-Man was the right thing to do. I also find the Punisher interesting due to the fact he’s one of the few Marvel characters who doesn’t actually have any special abilities. And I do have some sympathy for his character, due to the fact that his past sounded like a truly awful one. I did find it interesting to see a bit about Spider-Man’s past. There was clearly tension between him and Harry… but I really didn’t like Mary Jane in her brief appearance. She seemed very shallow and not at all sympathetic to what Peter had gone through with Gwen. I did empathise a bit with what the Punisher went through with being manipulated into going after the gangs. Although I didn’t like his methods, it was good to see that he refused to hurt innocent people… and that how the gang war affected innocent people was what made him want to put a stop to the gang war. There was clearly a vicious cycle of vengeance and it was good to see that the Punisher did understand that. I felt sorry for the other man who was manipulated into trying to kill him and I was satisfied with the way that bit was ended. The gang of Punishers was quite creepy and I couldn’t help feeling sorry for them… even though the majority of them were probably criminals. The artwork showing Jigsaw’s face was especially creepy and there were a lot of dark moments in these comics. It was good to see that the Punisher was intelligent enough to protect himself, even if he was getting old. 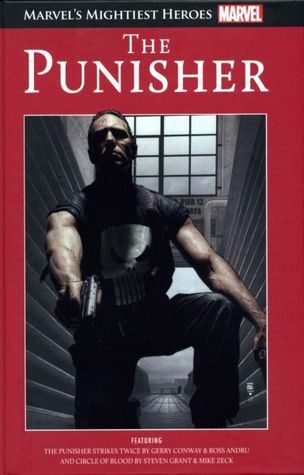 I’m not sure I’d want to read any comics focusing only on the Punisher, due to not really liking the way he does things. But I’d be interested in seeing him interacting with other characters in the Marvel universe.